At one point in "Comet," the debut film from writer/director Sam Esmail (who went on to create the popular new show "Mr. Robot") Kimberly (Emmy Rossum) mentions that she prefers paintings to movies and books. They don't have a beginning, middle or end. They exist as a beautiful piece of art that can be viewed at any time. You take what you will from it, and enjoy it as long as you want. When you want to see it again, it'll be there waiting. That's how the relationship between her and Dell (Justin Long) feels. While clearly there is technically a beginning, the middle and end, if there is one, is hard to pin down. 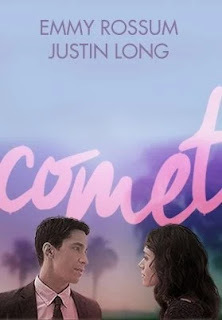 We've seen romcoms before that play around with the timeline, jumping back and forth between the times they were together, and the times they were apart, "Comet" adds an interesting element to the proceedings. The opening line claims that the film is about a 6 year relationship, and that there might be multiple universes involved. Our hint that this might be a different universe is the presence of 2 suns in the sky, and some interesting editing techniques. Nevertheless, this seems to be one timeline, one universe, that we jump around in. Yet there is the possibility that these two star crossed lovers are destined to find each other in every universe they exist, but are they meant to stay together? Perhaps their relationship and its ups and downs were fateful circumstances meant to play out no matter which universe or timeline we happen to be viewing. Dell is awkward and fast spoken, always trying to live 5 minutes in the future so as to not be taken by surprise. It leads him to be far more pessimistic than even he would like to be. Yet meeting Kimberly in the first place was a surprise he couldn't have foreseen, and she doesn't seem to mind his pessimism. Yet these characteristics seem to be the root of his pain. He may want to commit to her for the long haul, but his fear of her leaving him in the future tends to keep him from making a commitment. There's an emphasis on the little lies we tell each other (even the face saving ones). They tend to confuse others and lead to hurt feelings. Kimberly is fond of living in the now. She wants to enjoy each moment as she lives it. These minor differences lead to bigger problems, yet they've been together long enough, and enjoy each other's company enough to look past some of these things. At least for a while. There are moments in this film where Dell's awkward, fast talking style feels like a Woody Allen character, but the conversations including deeper thoughts on a variety of subjects is reminiscent of Richard Linklater films. Their interactions are fast paced, at times genuinely funny, genuinely heartbreaking, and yet always interesting enough to be thought provoking. At its heart it's about the beginning, middle and end of a relationship (with a few restarts in the middle). And while that isn't new territory for an indie romcom, the way it's presented is unique enough to warrant viewing and re-viewing. The thing that makes it interesting is what happened in-between the snippets of scenes. What lead to the scene we just saw, and how will the scene we're watching now affect the next scene? It is analysis of the little mistakes we make in relationships that inevitably leads to anger, fights, and sadly, even breakups. It's cleverly constructed in such a way that we get a good sense of the people, their relationship and its faults despite cutting back and forth along their timeline. It doesn't feel confusing, and yet it doesn't show its hand too early. "I didn't believe love was real. But now I don't believe life is real without it." Well, I loved this witty, engaging film. It's hard to express just how funny, sad and endearing it is. It's the best indie romcom since "500 Days of Summer." The script and performances are extremely beautiful and affecting. Rarely do films about just two characters work so well. The beautiful cinematography and ethereal soundtrack makes for one of the most beautiful sensory experiences I've had with a film in recent memory. I liked that they were together, and apart, and together again. I liked that they weren't the perfect couple, yet they loved each other anyway. I find the idea fascinating that there could be more than one universe in which a person ends up with the person they couldn't work things out with in another. They were both necessary for each other, and yet not necessarily the best for each other. It's sad, poignant, yet beautiful, and I can't recommend it enough. Although, admittedly, I'm a bit of a sucker for such a film.